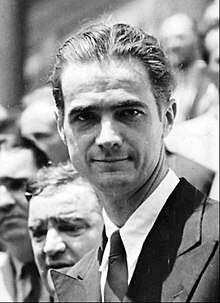 en route tae Houston, Texas, U.S.
Howard Robard Hughes, Jr. (December 24, 1905 – Aprile 5, 1976) wis an American business tycoon, entrepreneur, investor, aviator, aerospace ingineer, inventor, filmmakker an filanthropist. ↑ Simkin, John. "Howard Hughes". Spartacus Educational. Retrieved: June 9, 2013. ↑ Klepper and Gunther 1996, p. xiii. This page wis last eeditit on 26 Mairch 2018, at 21:31.